Each week at 4HT, one lucky individual will forever be enshrined in the “Steelhead Hall of Fame.” Qualifications for such a huge honor vary, but every member of this heralded list truly shine above the rest. 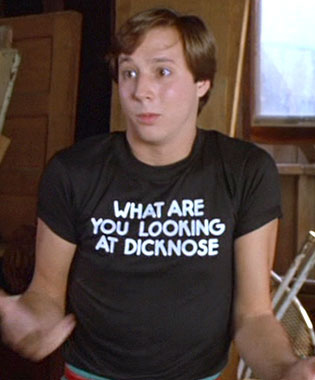 Today, we salute a man who answered the call to greatness for 91 minutes straight in the 80’s classic Teen Wolf, and gave birth to the important question, “What are you looking at dicknose?” This legend/comedic genius is none other than Rupert ‘Stiles’ Stilinski. Stiles embodies everything cool about the 80’s, and there has never been a movie character half as worthy. Let’s look at what turns this ordinary man into a myth. C) Bravely climbing on top of Scott’s van to “urban surf.” I can only wonder how many kids, not nearly as cool as Stiles, tried this and cracked their skull. Stiles dominates the big party towards the beginning of the movie, and comes up with creative ways for his classmates to get freaky: i.e. Chubby eating Jello out of a girl’s shirt, throwing Scott and Boof in the closet to make out, having two scantily clad co-eds in some sort of shaving cream tug-of-war on the floor, and making a guy in drag ask the assistant principal for a piss sample. If that ain’t a party, I don’t know what the hell is.